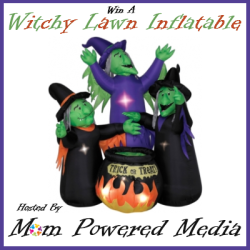 ATTN BLOGGERS: I just signed up to be a part of the FREE Witchy Lawn Inflatable giveaway blogger event being hosted by Mom Powered Media. One lucky reader will win a Three Witches with Cauldron lawn decoration to add to their front yard this Halloween when decorating! Pretty cool, huh? I know my family would love to have this in our yard! Bloggers can join in and give their readers a shot at this awesome prize by clicking here to sign up for the event. Cost: Free with announcement post or $3.00 with out. Prize: Three Witches with Cauldron lawn decoration. Dates: September 20– October 14. Giveaway is Open to US and Canada.